LONDON: Pakistan High Commissioner Mohammad Nafees Zakaria has said that Pakistan’s constitution gives full protection to minorities and we as a nation do consider that there is no minorities in the country and all are integral part of the society. 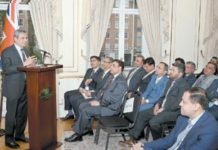 He was addressing a meeting held at the High Commission here on Friday (5th April) aimed to project the services of Christian diaspora for Pakistan and Pakistani nation while staying there. The High Commission organized this reception in honour of the British missionaries, educationists and philanthropists who had lived and served in Pakistan. 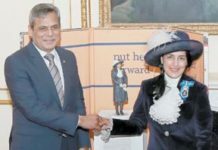 The event entitled, “The Journey of Love” was part of High Commissioner, Mohammad Nafees Zakaria’s outreach initiative to connect with the British friends of Pakistan and the Pakistani Diaspora in the UK. In his remarks, the High Commissioner commended the contribution of the British Missionaries, Educationists and Philanthropists towards the development and progress of various segments of society in Pakistan. He said people of Pakistan still cherish the good work and fond memories of the British Missionaries. Mr Zakaria acknowledged with deep appreciation the support of Christians, in particular, among the followers of other beliefs, to the Quaid-i-Azam towards creation of Pakistan and during the formative period of the newly born country. The High Commissioner said Pakistan is rich in cultural and religious diversity as its population comprises the Christians, Sikhs, Budhists, Hindus, Parsis, Zoroastrians, Bahais, and small portion of the Kalash, Kihals and Jains. 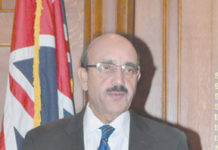 Speaking about the rights of country’s citizens of various faiths and beliefs, the High Commissioner said that Constitution of Pakistan protects the rights of all the citizens without any discrimination. The Government of Pakistan is cognizant of its responsibilities towards its citizens, irrespective of their faith or belief. He stressed on interfaith harmony and love for all. Nafees Zakaria said that the purpose of gathering today is to acknowledge and express our profound thanks to those friends of Pakistan who have rendered crucial support to the movement since the inception of Pakistan as an independent sovereign country and rendered valuable services in the development of Pakistan after the independence. These friends of Pakistan include Missionaries, Educationists and Philanthropists. “At this occasion, I am reminded of the vision of founding father of Pakistan Quaid-e-Azam Mohammad Ali Jinnah, which he shared in his address to the Constituent Assembly on the eve of independence when he said among other things; “That you are free to go to your temples; you are free to go to your mosques or to any other places of worship in this state of Pakistan. You may belong to any religion or caste or creed — that has nothing to do with the business of the State”. He said that in line with Quaid-e-Azam’s vision, you fulfilled your responsibilities with dedication by rendering special services related to the education, health and rehabilitation of the poor and the needy. You are instrumental in changing the lives of many in Pakistan, for which we owe you, our gratitude. Referring the history, Nafees Zakaria said that after the creation of Pakistan, the Christian community participated in all the constitutional deliberations to their best and has always stood side by side with their Muslim co-patriots through every thick and thin. “Our Christian brothers and sisters have made remarkable contributions to the nation and have long been active in various fields of public service. Many Christians have served in the Pakistan Armed Forces, civilian services and other organizations. Some have received high civilian and military awards as well. Contributions as educationists, doctors, lawyers, sportsmen and businessmen are significant and appreciable”, he added. “Pakistan is a Muslim majority country but its population of 220 million has among us Pakistani citizens belonging to various faiths and beliefs, such as, Christians, Hindus, Parsis, Zoroastrians, Bahais, Sikhs, Buddhists, Kalasha Kihals and Jains. They are all citizens of Pakistan whose rights are protected under the Constitution of Pakistan”, he emphasised. “While acknowledging the contributions to the development of Pakistan by our citizens of different faiths, I am reminded of Justice A.R Cornelius, Chief Justice of Pakistan, Law Minister Jogendra Nath Mandal, Justice Dorab F. Patel, a Zoroastrian, Chief Justice of Sindh High Court and later Justice Supreme Court of Pakistan, Justice Rana Bhagwandas, a Hindu, Chief Justice of Supreme Court of Pakistan”. Pak envoy paid special tribute to Dr. Ruth Pfau, also known as Pakistan’s Mother Teresa, who devoted more than 50 years of her life fighting leprosy in Pakistan. In the contemporary times, he referred numerous examples to cite of those who have risen to high positions in various institutions of Pakistan like Krishna Kumari Kohli, a first female Dalit Senator from Hindu Community in Pakistan and scores of civil servants belonging to faiths and beliefs other than Islam, who were rendering valuable services to the country. In Foreign Service of Pakistan a number of Christian, Hindu and people of other religious beliefs are working shoulder to shoulder with us. Likewise, in many other civil service cadres, you will find people from different beliefs. Mohammad Nafees Zakaria particularly mentioned Dr. James Shera who was second among the Pakistani Community to become the Mayor of Rugby. He was decorated by the Government of Pakistan with Sitara-e-Pakistan for his services and there is long list of people of different beliefs originating from Pakistan, residing in this country, and many other places across the world providing their services. In education sector, the institutions established and run by the missionaries and Educationists who are sitting are flourishing over the years in Pakistan and have produced some of the big names who have made the impact, not only in Pakistan but all over the world. Quaid-e-Azam Muhammad Ali Jinnah is also among many who have received part of his education from the Convent School. Pak envoy highlighted some of the measures which the successive governments of Pakistan have taken for its citizens of different religious beliefs, other than Islam. These measures include establishment of Ministry of Religious Affairs and Interfaith Harmony. This Ministry is operating three schemes – small development scheme, financial assistance and scholarships – for the welfare of non-Muslim Pakistanis. “For the minorities, 04 seats are reserved in Senate and 10 in National Assembly. Seats are also reserved in the Provincial Assemblies. 5% quota of the jobs at Federal and Provincial level has been fixed”, he referred. While addressing at the occasion, Bishop Michael Nazir Ali suggested easy access of Christian community to visa facility. He also demanded denationalisation of Christian schools like Christian churches to pave the way for partners from the UK and other countries to extend help. “Christian hospital are playing pivotal role in providing medical services in Pakistan and these are in need of facilities which should be provided by the government”. He praised the topic of the meeting “The Journey of Love” as wonderful and recited some couplets from the poetry of Maulana Jalal-Uddin Roomi with special reference of love and affection. Reverend Sandy Sneddon, in his speech, demanded implementation of 5% quota allocated to Christian community in Pakistan and said the Christians are grateful of Pakistan for looking after our interests. He referred 2011 when Christian minister Shahbaz Bhatti was murdered in Pakistan and a condolence meeting was held at the high commission under the supervision of Mr. Nafees Zakaria the then deputy high commissioner. “Gen Javed Qamar Bajwa won our hearts by celebrating Christmas with us in the UK”, he recalled appreciating the gesture. Those who also spoke on the occasion included Parliamentary Under Secretary of State, Department for Transport, Nusrat Ghani MP, Revd Rana Youab Khan, Mr. Rupert Gold, Mrs. Caroline Tisdall and Mrs. Rosemary James. They shared with the audience fond memories of their work and stay in various parts of Pakistan. The speakers shed light on the contributions of the British Friends in the progress and development in the socio-economic and cultural spheres of life in Pakistan since independence. They praised the people of Pakistan for their hospitality, love and religious tolerance. A large number of the British missionaries, educationists, philanthropists, members of the Pakistani community and media attended the reception. The British friends appreciated the High Commissioner’s gesture which would help further strengthen the bilateral relations. Dr Arif Malik moderated the event. Sufi Opera singer Saira Peter, belonging to the Christian fraternity of Pakistan in the UK, entertained the audience with her beautiful voice.